This section of our website highlights the latest news and breakthroughs in weight loss management and obesity. It is constantly updated as new information becomes available. If you wish to comment, please email us. We congratulate shadow treasurer Joe Hockey for the positive step he has taken toward overcoming his weight struggle and improving his health by having the Sleeve Gastrectomy procedure. Joe has already lost 20kg in just a few weeks following his successful procedure. A landmark research project into the long term success of the gastric band from Melbourne has shown that patients maintain an average loss of 26kg 10 years after gastric banding surgery. This research confirms that gastric banding surgery leads to long term weight control. Want to get better weight loss, or a bit stuck mid-way along your weight loss journey? Attend a support group! Moderated by our psychologist Dr Sonia Haggman, support groups are a great way to get back on track. Topics include emotional eating, head hunger, breaking old habits, and relapse prevention. Studies show that people who attend support groups lose more weight than those that don’t. OClinic support groups are held on Monday evenings in our main offices at 21 Gillies st Crows Nest. Please register by email or telephone. Click here to see the list of upcoming support group dates. An just-published American study has shown that bariatric (weightloss) surgery is far more likely to result in remission of type-2 diabetes than intensive medical therapy. Click here to listen to the medical update courtesy of MDFM. The FTO gene, which stands for “fat mass and obesity-associated gene” may be more prevalent than first thought. Discovered in 2007, the FTO gene may be carried by up to 65% of Caucasians, and 44% of Asian people. 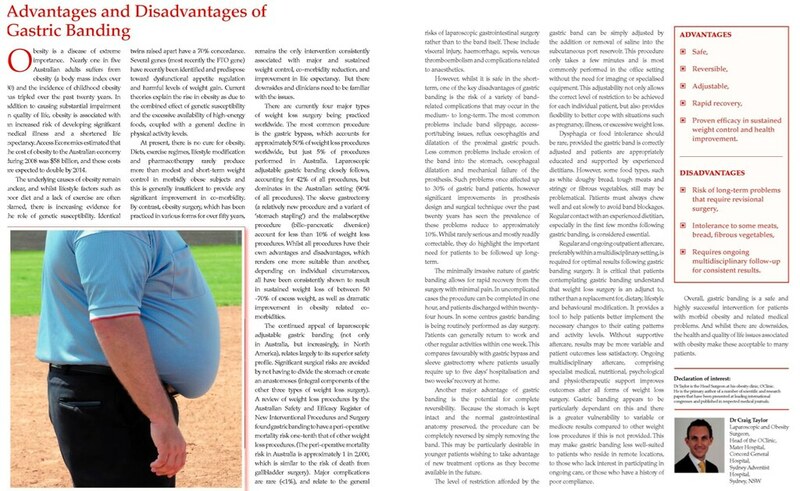 Carrying this gene increases the risk of developing a serious weight problem by 12%. However it has been recently discovered that regular physical exercise can reduce the risk of a person who carries this gene will develop obesity by up to 30%. American Golf pro John Daly is once again in Sydney. John had Gastric Banding surgery 3 years ago in the United States to help him control his weight- at the time of his surgery he weighed in at 135kg and was facing a bleak health outlook. 3 years later his weight is stable at 94kg, a good weight for his tall frame, and John is living life to the max. His 19-year old daughter (17 at the time of her surgery) has also had the LapBand and has lost 60kgs. A recent article published in the Sydney Morning Herald looks at why diet and exercise just aren’t enough by themselves to combat obesity. “Studies suggest obese adults who modified their diet and exercise lost less than five kilograms within two to seven years, while those who took who had surgery reported weight loss of 25-75 kilograms within two to four years of the (gastric banding) procedure”. The article points toward the underlying genetic basis for obesity, and quotes a number of leading Australian experts who are calling for weightloss surgery to be made more available to the community, especially those with diabetes. The United States (US) Federal Drug Administration (FDA) is joining Australia in the battle of the bulge by approving the gastric band for use in obese adults with a Body Mass Index (BMI) as low as 30 and one obesity-related condition. Australia was the first in the Asia-Pacific region to recently approve the gastric band for use in people with a BMI over 35 or a BMI greater than 30 with at least one serious, obesity-related condition. For the first time, adults across the whole obesity spectrum who have failed conventional weight loss measures (diet, exercise and medication) can access this clinically effective, long-term, weight loss option. According to Professor Paul O’Brien, Head of the Centre for Obesity Research and Education (CORE) at Monash University, Melbourne, broader use of the gastric band among obese adults will have a significant and positive effect on health in Australia and the US. “We know that serious, obesity-related health complications have already begun by the time a BMI of 30 is reached, which is the lower limit of obesity. The gastric band was previously available to those with a BMI of at least 35 and one serious, obesity-related condition. Until now, obese people with a BMI under 35 who carry significant health risks have had limited options to improve their health when other conventional weight loss measures, such as diet and exercise, have failed,” said Prof O’Brien. “If left untreated, research shows that these people will likely remain obese,2 placing themselves in danger of developing serious health conditions, such as diabetes, high blood pressure and heart disease. While these simpler, non-surgical options should certainly form part of all initial weight loss attempts, we know with confidence from our Australian clinical data, that gastric banding is a viable, effective option for people unable to maintain weight loss with conventional methods,” Prof O’Brien said. “In one of our landmark studies that contributed to the FDA’s decision to expand the indication for the gastric band, those who had mild-to-moderate obesity (BMI 30-35) showed very clear benefits with the gastric band compared to a matched group who received the best conventional weight loss treatment,” said Prof O’Brien. At two years after entry into the study, the gastric banding patients had lost an average of 87 per cent of their excess weight compared to those who followed a conventional program and lost just 21 per cent of their excess weight through diets, improved eating habits, and increased exercise and lifestyle changes. Finally the world is waking up! Obesity is a chronic medial condition just like epilepsy, asthma, or diabetes. It is often hereditary. People who suffer from obesity often punish themselves with self blame. This is inappropriate. The medical world views obesity as simply a condition whereby a persons energy regulation system is faulty, resulting in a chronic energy imbalance. Fortunately effective treatment now exists- Procedures such as gastric banding and the sleeve gastrectomy help to correct this imbalance by making a person feel less hungry, and full with smaller protions. Patients still must play their part by making healthier food choices and doing regular exercise in order to overcome the condition. Does a big breakfast really help you lose weight? Many people believe that a big breakfast is an essential part of a weightloss diet. It is commonly believed that eating breakfast helps to speed up a persons metabolism, and results in requiring fewer calories at lunch and dinner, thereby lowering the overall calorie intake for the day. Recent research at the University of Munich has shown that this belief is incorrect- a study involving 400 people demonstrated that those who ate a big breakfast did not eat less for lunch or dinner, and ended up consuming an additional 400 extra calories per day, whilst those who skipped breakfast altogether had overall fewer calories leading to better weight loss. We encourage our patients to just eat when they feel hungry- Patients with a gastric band usually do not feel hungry in the morning, and often force themselves to eat breakfast in the belief that it is important for successful weightloss- remember the needs of an obese person are different; the key to successful weightloss is minimising calorie intake. You already have plenty of stored energy on board. So its ok to skip breakfast! Just eat when hungry, focus on small, protein rich meals, keep up your water intake, take a mulitvitamin each day, and try to do a little bit of regular exercise. Patients who follow this strategy almost universally to well. Read the article, written by OClinic Surgeon Dr Craig Taylor, about the Advantages and Disadvantages of Gastric Banding. It appears in the current edition of the respected medical journal Cardiology in General Practice (Vol 12 pages 16-17). Three Australian health funds, namely NIB, AHM, and Manchester Unity, have announced that they will restrict access to Gastric Banding surgery to members with top cover. Previously these three health funds allowed all members to undergo obesity surgery without imposing any additional premium. This new policy, to take effect from 1 June, actually equates to discrimination against obesity sufferers, as it amounts to an ‘obesity premium’ if members wish to have obesity surgery covered. Its important to note that the majority of Australian health funds remain committed to weightloss surgery, and have not announced any changes to their coverage. Medibank Private, MBF, and HCF, as well as many of the Alliance health funds (such as Defence health, Teachers heath, etc) are to be congratulated on their continued support. Obesity surgery is one of the most widely studied types of medical intervention performed- all the available research has consistently shown major health benefits, lifespan improvement, and a better quality of life for people with obesity. It has also been shown to be highly cost effective for the community, as the costs of managing diabetes, heart disease, etc are substantially reduced, and obesity sufferers can re-enter or take better advantage of employment opportunities. Members of NIB, AHM, and Manchester Unity funds can still have gastric banding covered under their existing policy if their surgery booking is made before 1 June. (The surgery date itself can be performed any time up to 1 Dec). If this applies to you, please let our reception staff know when you call so that we can help you meet this deadline. Michelle Obama has launched a major initiative to help tackle the rising crisis of childhood obesity in the United States, where 1 in every 3 children are now overweight or obese. The obesity rate amongst American children tripled between 1980 and 1999, leading to fears the American health system may not be able to cope with the anticipated rise in health related expenses. A landmark study published in this month’s edition of the respected medical journal JAMA found that gastric banding surgery was far more effective than diets and exercise in treating obesity in teenagers. The government-funded randomised controlled study by Melbourne’s Professor Paul O’Brien involved 50 teenagers between the ages of 14 and 18 years. All participants had a body mass index of at least 35, and 40% already had developed the Metabolic Syndrome. 84% of the gastric banded teenagers lost at least half of their excess weight compared with just 12% of those in the diet and exercise group. The Metabolic Syndrome had resolved in all of the teenagers who had gastric bands. Whilst one third of those in the gastric banded group underwent a revisional procedure, this was to correct relatively minor problems- there were no serious complications or deaths. A study involving 300 children with severe obesity by the University of Cambridge has uncovered a gene on chromosome 16 that has a strong link with severe obesity. Researcher Dr Sadaf Farooqi said: “Our results suggest that one particular gene on chromosome 16 called SH2B1 plays a key role in regulating weight and also in handling blood sugar levels. “People with deletions involving this gene had a strong drive to eat and gained weight very easily. “It adds to the growing weight of evidence that a wide range of genetic variants can produce a strong drive to eat. This latest research adds yet another gene to the growing list of genes linked with obesity. It is becoming increasingly clear that obesity is a genuine medical disorder with an underlying genetic basis, and that the perceptions of obesity being caused simply by poor lifestyle choices must now change in light of the emerging evidence. Australian researchers have discovered a critical link between obesity and the risk of developing breast cancer. Scientists at Melbourne’s Prince Henry Institute have found that fat cells stimulate production of the hormone oestrogen, a known stimulator of the growth of some forms of breast cancer cells. In obese females, oestrogen production is overstimulated, increasing the risk of developing breast cancer. Previous research from The MD Anderson Cancer Centre in Texas has shown that overweight breast cancer patients are more likely to have a more aggressive form of the disease and die sooner. But on a positive note, another major study has found that weightloss surgery can reduce an obese person’s risk of dying from cancer by 38%. click here to read about the Prince Henry Institute link between obesity and breast cancer click here for the MD Anderson study on obesity and more aggressive forms of breast cancer click here to read about the links being discovered between obesity and other forms of cancer cllick here for the Swedish Obesity Study linking weightloss surgery to reduced cancer mortality. Hundreds of surgeons from around Australia and New Zealand have once again converged for the Annual Scientific Congress, held this year in Brisbane. The 3-day bariatric (weight-loss) surgery section was amongst the most well attended part of the meeting, and featured several distinguished guest visitors from around the world including Dr Gerhard Prager (Austria), Dr Simon Dextor (UK), Dr Christine Ren (USA) and Dr George Fielding (USA). the Obesity Surgical Society of Australia and New Zealand annual weight-loss surgical congress. The annual 4-day congress to discuss surgery for obesity was held this year in Cairns. Over 230 delegates from all over the Asia Pacific attended including obesity surgeons, dietitians, nurses, and psychologists. Whilst OSSANZ has had annual meetings over the past 22 years, this meeting was combined with the inaugural meeting of the IFSO-ASIA PACIFIC chapter, resulting in a number of surgeons attending from India, China, Korea, and Japan. Although the incidence of childhood obesity is increasing, it is not because kids watch too much TV or play computer games- indeed there is no evidence that today’s children do any less sport or physical activity than in previous generations. Rather, obesity arises from a genetic tendency, which is becoming unmasked at an earlier age because of the increased availability of fast food and high energy snacks. Migraines are experienced more frequently in people carrying excess weight. Whether this is due to poor oxygenation during sleep as a result of snoring or sleep apnoea, or due to other factors, still remains unclear. A recent study has revealed a link between obesity and people who sleep for either less than 6 hours, or more than 9 hours, each night. Pregnant women who are obese are twice as likely to give birth to children with a birth defect. Whilst the link between obesity and infertility, gestational diabetes, and pre-eclampsia has been well known for many years, the link to birth defects has not been known until now. Pregnancy following gastric banding surgery is safe, and may prevent such problems. A Victorian study has found that the costs associated with type 2 diabetes far outweigh the costs involved in gastric banding, which is an effective therapy for this condition. Gastric banding is so effective in the treatment of obesity and its related disorders that calls for it to be performed in NSW public hospitals have been made once again.